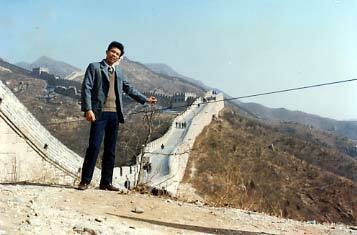 The author's father shows us the Great Wall, one of China's most famous sights. Have you ever wondered what China looks like? If you haven't yet, here you go. You are lucky enough to know about my country. You will know the sights, sounds, smells & tastes, actions, colors of my country. You will know how exciting that can be. Why? Keep reading and find out. 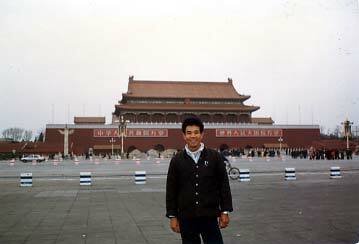 As you may know, Beijing is the most famous city in my country. It is the capital of China. It is in northeast of China. The Great Wall is the longest wall and oldest place in Beijing. The most popular place is the computer bars, although it is the same as the regular bars where can drink soda pop, but we can go to the Internet and make new friends. The women's museum is a very specific museum in my city because it collects much information from Chinese history that is all about women. Also, it is the most artistic museum I know. If you listen you can hear roosters. They are the same as clocks in the morning. Roosters usually remind people to get up who live in the country. You can also hear people who eat dim sum in the restaurants. They are noisy in China because waiters always shout what they sell. In school you can hear students read aloud with expression. They have to read books in the morning during the reading time. That help students to practice to give a good presentation. You can smell and taste moon cakes. They are the sweetest food in China. We eat moon cakes during a special holiday. That holiday in China is the same as Thanksgiving in the USA. Dim sum is the most attractive food in my country; we can have a lot of choices for breakfast. I think Chinese broccoli is the most popular vegetable in China because it is very healthy for our bodies. It has a lot of energy. Chinese people usually eat it from fields where they grow Chinese broccoli. Did you eat it before? Bicycles are the most important transportation in China. Everyone should have his or her own bicycle. If you go to China, you will see the bicycle is the same as the population of China. So, you should learn how to ride a bicycle before you go to China. I think barbecue is the most popular outdoor activiy in China. It is not so expensive and it can help you to save money. Collecting stamps is the most modern indoor activities in China. Don't you agree they are interesting and fancy? Maybe you know red and yellow colors represent the Chinese flag. I feel a sense of pride, when I see the flag. Black color represents the Chinese people who have black eyes. "Yellow color represents Chinese people who have yellow skin". Well, believe me, China can give you an unforgettable and a memorable vacation! Come on! Don't wait!